I pulled out my Zoom G3X today and decided to try and learn how to use it. It is my second biggest waste of money I ever spent on gear. I bought a mike and stand, to record my acoustic guitars, tried it out, then never used it again. I managed to lose the mike, then bought a replacement mike and tried that out. I then found the first one and I still have to use either! Actually, second place probably goes to my Marshall Class 5, which I have used for all of 5 minutes. Anyway, back to the Zoom. My problem is I have never used a pedal board and have no idea what to place where. Also, unlike when you buy the odd pedal, and learn how to use it, I have tons and cannot use any of them! I decided, this evening, to set up one patch and play with each pedal in turn. I am learning, but I will now have to go onto Google and do some research. So tell me, as a rhythm guitar player, which TWO pedals should I go for first? Compression/Chorus? Tremolo/Delay? Wah/Reverb? What two pedals do you guys recommend? Which two pedals? I guess it depends on what style you play and what sounds you like to have to hand (or foot). I would choose a compressor and an EQ if I could only have two pedals. Thanks, Lester. These are two pedals I would not have given a lot of consideration to. To me a Compressor never appears to do very much, and Equalisation is something I try to handle by my guitar settings, and, when I use one, the amp. I will give them a serious try. I play various styles, but usually lighter sounding stuff (I am a great Eagles fan), and always rhythm. If you like chorus, try it with a compressor before the chorus. The thing with EQ is I find that the tone knob on the guitar doesn't allow for finer possibilities such as cutting some lower mids to make the sound less muddy and/or boosting the highest frequencies to add some sparkle to the sound. For an Eagles acoustic rhythm I would add a light to medium compression, a light and slow (stereo if possible) chorus and EQ to taste, depending on the sound of the guitar and strings plus how and where (along the length of the strings) you are strumming. Re effects order, I generally go compressor-distortion/overdrive-eq-chorus/phaser/flanger/other modulation-delay(s)-reverb. But I suppose no rules. Also, since I bought my Line 6 Helix (I may have mentioned this before...) I've generally use the amp models to get my overdrive/distortion (if required) or just into a clean amp emulation, then into a speaker/cab model, and then after that I have the modulation, delay and reverb effects after that in the chain. So it's a bit like having a miked-up amp, and then having the sound guy add effects to that signal. I never did this when I was using my G3, and didn't ever try the amp models on that, come to think of it, but thinking about it, I could have, and probably should have. But I do think you're spot on with the try one thing at once approach, and see what you can get from it, and what you like. Also, I've come to the view that most of the time, the best use of effects is sparingly - things start to sound processed and artificial with too many effects chained together. Great advice from Lester - a man who knows his stuff! Also, although you have to separate the wheat from the chaff, there are Youtube videos with good general advice and ideas on using effects well. I agree with Megi with one proviso: when I started with effects I needed each effect to be overdone so that I could hear what it was doing. As I became accustomed to hearing what the effects do I started turning them down to practical levels. I guess an analogy would be like using spices in cooking - at least it worked out that way for me! I would say don't feel afraid to overcook your effects in the name of learning but be prepared to fine tune to taste after a while. Spent a couple of hours this evening with some Compressor pedal effects, and an Equaliser pedal. I had watched a couple of videos this afternoon, so had an idea what I was doing. Found the EQ made a difference, but the Compressor was excellent. I ended up using the Rack Compressor, and what a difference that makes to my sound. The best guitarists I've seen out there recently, they aren't on this forum. I often wonder why. Maybe the guys that set up the factory settings effects on these multi fx units should read what you've said there Lester about turning the fx levels down to practical levels. 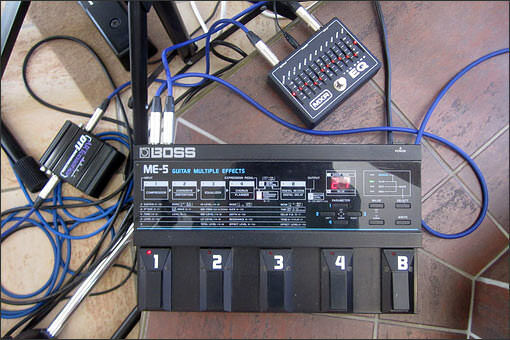 I had a higher level Boss GT8 pedal once and had to get a Michael Casswell DVD to find out how to get decent sounds. A lot of the DVD was about how to best tame the overblown standard settings. Ended up too much work on setting up a sound and too little time playing. I have just deleted the inbuilt sounds and started building my own. Mark, I wonder whether the multi-FX companies make their built-in sounds a bit OTT for beginners such as I was, wanting to hear what each effect does. Any buyer already familiar with such units is more likely to do what Jocko has done - ignore the presets and build their own. It's a thought; true or not I haven't a clue. Jocko, back to the EQ thing: here is an example, my setup for church this morning where the output of my multi-FX feeds into the EQ and from there into a DI box and to the sound desk and PA. It is difficult to see the EQ settings. Ignore the far left and right adjusters as they are volumes, all the ones in between are a small hgrahic EQ. As I don't have a speaker sim I tailed off the higher frequencies to simulate the response of a guitar speaker and lower down I lowered 125 and 250Hz as the church has no acoustic treatment and so sounds like a small cathedral with a real (resonant) problem at 190Hz, which is what I targeted. Thanks Lester. I have used EQ on Hi Fi, setting the frequency attenuation to suit what I wanted to here. The guitar just seems to be the same. Tweaking the sliders to achieve the sound you want out of the instrument/equipment/environment you are playing in. For me it is really just the instrument, since I just have earphones plugged direct into the Zoom. Regarding the OTT patches, I think you are right. It is just to make those listening to it for the first time think, wow, can I do that. It is only once you get the thing you think, do I really want to DO that! There are some good G3 patches out there, that you can download, that emulate desirable recorded sounds. You can also learn a lot from examining them and how the various "pedals" are set up. I have currently set up patches, each with a group of the 116 different "pedals", so that I can play through each "pedal", by itself, and play with the various parameters, with a view to learning how each works and what effect it has. I am also finding what "pedals" I can disregard, as having no place in my musical repertoire. "Slicer" anyone? Good points Lester and Jocko about why the OTT fx on these units. You could well be right - but it's a pain in the aspidistra for those of us looking for realistic and sensible simulations. It does seem to have got worse over the last 20 years - a Zoom mult fx I had back in 1999 had a set of presets that were nearly all usable, and my Tonelab LE (lots of lovely single function knobs and buttons ) - the only multi unit that has survived in my collection - had a fair few usable presets amongst a few of the more extreme examples. I had a G3X for a fair time and i do seem to recall it was fairly user friendly. It was at least fairly straightforward to build your own sounds and you could have a lot of fun designing your own Jocko. If I hadn't got the Tonelab LE I'd still have the G3X.